Huawei Honor 8x Tips & Tricks - Hi Guyz, is Artcile me 14 Huawei Honor 8x Tips & Tricks & Hidden Features share karunga, Huawei Honor 8x me kafi New & Hidden Features hain jo is Tips & Tricks me cover kiye hain. Huawei Honor 8x mid range mobile phone hai But is mobile ke Features kafi Amazing hain, Huawei Honor 8x ki Tips & Tricks & Hidden Features is article me share kiye hai but Huawei Honor 8x ka Review & Nova 3i se comparison ke article already hain. Wallpaper Widgets and Transaction ka option sabhi smartphones me hota hai, ye options mobile ki Home screen ko customize karne ke liye diye jate hain. Huawei Honor 8x me kafi Amazing Wallpapers milte hain, or saath me aik option milta hai bluring ka jis se kisi bhi Wallpaper ko select karne ke bad usko blur kar sakte hain jis se Home screen par icons clearly show ho sake. Huawei Honor 8x me Widgets & Transaction ke option same as other mobile phones ki tarah hain kuch new changes nahi hain. Huawei Honor 8x ke Camera app me kuch different features mil jate hain, Camera app ki setting ko open karne ke bad aik option milta hai 'watermark' jis se Camera se capture ki gai pictures me aik logo add kar sakte hain. Huawei Honor 8x ki Camera settings me Ultra Snapshot ka option milta hai, jo Fastly picture capture karta hai means mobile phone ko unlock karne se pehle picture capture karni hai to simple Volume down button ko 2 times press karne se picture capture ho jayegi. Normally Smartphones me screenshot lene ke liye Volume down + Power button ko use kiya jata hai, Huawei Honor 8x me ye method bhi hai and also Upper me Notification bar me Screenshot lene ke liye aik option mil jata hai. Huawei Honor 8x ki settings se Eye Comfort ko enable kar sakte hain, ye basically Eye Protection ke liye hai, Eye Comfort ko enable karne ke liye Settings me find karo or enable kardo, Eye Comfort ke saath schedule ka option milta hai jis se Eye Comfort ko auto enable ka time set kar sakte hain. Huawei Honor 8x ki setting me Home Screen Style ka option milta hai, Home Screen ke 2 options hain Drawer or Standard, Standard Home Screen me all Application Home Screen par hongi And Drawer me normal Smartphone layout milta hai. Huawei Honor 8x ki settings me Wallpaper me option milta hai 'Interval' is option se Time set kar sakte hain, for example: 5 minutes Interval set kiya to har 5 minutes ke bad Wallpaper change ho jayega. Huawei Honor 8x me beautiful Notch milti hai but koi person Notch ke saath mobile phone use karne me comfort nahi hai to settings me Notch ko disable karne ka option milta hai. Text Size ko set karne ka option sabhi smartphones me milta hai but Huawei Honor 8x me Text Size ke saath Text Style ko bhi change kar sakte hain, Settings me ye 2 options mil jate Text Size & Text Style ko change karne ke liye. Huawei Honor 8x me Screen Resolution ke liye Smart Resolution ka option milta hai, jis se Screen Resolution auto set hota hai, Huawei Honor 8x me Full HD Resolution bhi milta hai. Huawei Honor 8x me Face Unlock or Fingerprint scanner security ke liye milte hain, or saath he Face Unlock or Fingerprint scanner ko App Lock ke liye bhi use kar sakte hain. Smart Assistance me One Handed UI & Keyboard shifting ka option milta hai jis se comfortable use & typing kar sakte hain b'coz Bari screen wale Smartphones me 1 hand se use or typing ka problem hota hai 2 hands use karna parta hai, One Handed UI & Shifting keyboard se Screen & keyboard ko left ya right side par shift karke 1 hand se typing kar sakte hain. Smart Assistance me Scheduled Power On/Off ka option milta hai jis se mobile ko auto On/Off karne ki timing set kar sakte hain, Smart Assistance me Touch-disable mode ka option bhi milta hai jis se accidentally touches ko disable kiya ja sakta hai. 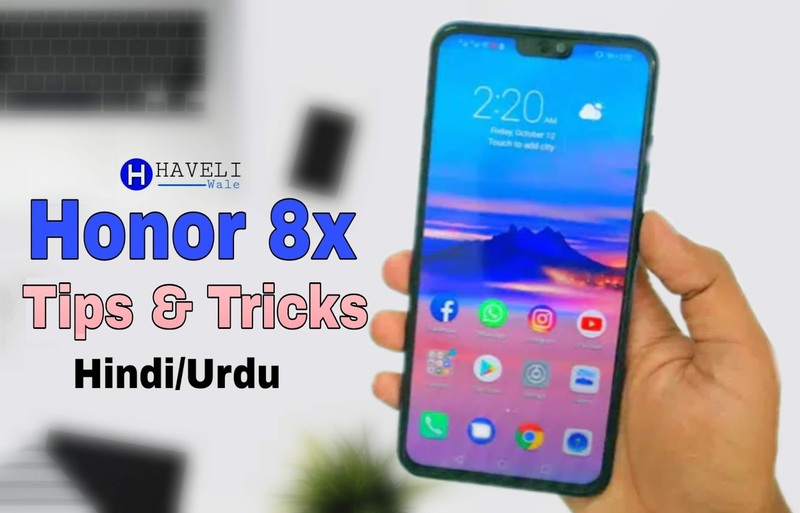 Mujhe Umeed hai apko 14 Huawei Honor 8x Tips & Tricks & Hidden Features pasand Ayenge, Huawei Honor 8x ki 14 Tips & Tricks me se ho sakta kisi ko kuch Tips & Tricks pata ho but kuch logo ko ye Hidden Features & Tips & Tricks nahi pata hote.